(Bloomberg) -- If the restroom on your next flight seems a bit snug, don’t assume you’ve picked up a few pounds. U.S. airlines increasingly are putting smaller lavatories on their planes -- and the economics of the decision means they’re probably here to stay. As labor costs rise and fuel prices surge, airlines are taking advantage of robust travel demand to squeeze as many passengers as possible into planes. Knee-bashing reductions to legroom and elbow-crunching cuts to seat size are well-known tactics. The latest method is to retrofit old aircraft and order new ones with svelte lavatories that allow for an extra row of seats. United Continental Holdings Inc. has the Rockwell lavatories on about 10 percent of its 737 fleet -- almost 35 planes-- and will use them on at least 155 more 737 Max jets, Boeing’s upgraded model of the single-aisle workhorse. Delta Air Lines Inc. has used the washrooms since 2014. 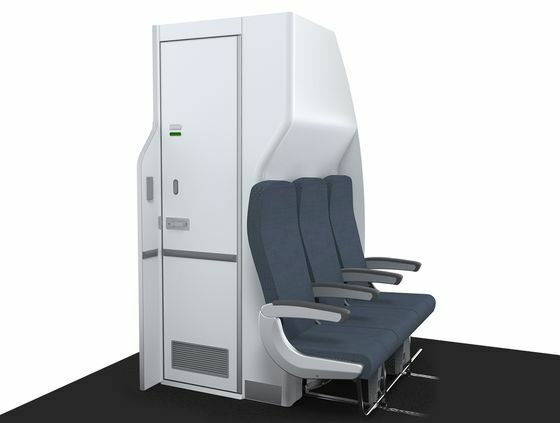 JetBlue Airways Corp., meanwhile, is outfitting some of its fleet with a small lavatory made by Safran SA’s Zodiac Aerospace. At shoulder height, the width of Rockwell’s Advanced Spacewall restroom -- made by the company’s B/E Aerospace unit -- is about the same as older economy-class restrooms. The space savings comes around sink level, as the wall curves in to allow a row of three seats to be tucked under the bend. The lavatory, which is just one available option, provides seven inches more of cabin space, according to a Rockwell spokeswoman. The company and several airlines declined to provide full dimensions. Flight attendants, who are on the front lines for traveler dissatisfaction, also criticize the smaller restrooms. The airline’s 737s offer two or three different-size lavatories, including one in the premium cabin, said United spokeswoman Maddie King. The washroom at the front of the plane often is larger -- but typically isn’t available to economy passengers.